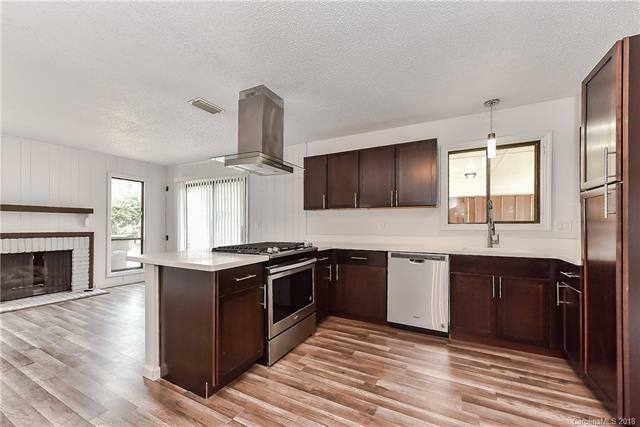 Tastefully, fully remodeled, this charming ranch home will impress your pickiest buyer! Open floor plan with custom interior design features gorgeous luxury wood laminate flooring, fabulous gourmet kitchen with brand new cabinetry and stainless steel appliances, appealing stone fireplace in living room, LG Hi-Macs solid surface counter tops both in kitchen and bathrooms, exquisite new ceramic tiles and brand new vanities and fixtures in bathrooms, new carpet and paint throughout. Property sits on a large, leveled lot with delightful, private backyard in a well maintained, established and quiet neighborhood, convenient to shopping, dining, mall, schools, medical facilities and interstate. Welcome home!